Spaying cats is a good idea for many reasons, including overpopulation and your kitty's health. Learn when to spay and find out about the various procedures your vet might use. In a world where the number of felines far exceeds the number of homes willing to take them in, it only makes sense to consider spaying cats whenever possible. All too many cats are eventually turned over to animal shelters, or worse, simply put out the door when they are no longer wanted. Life is hard enough for a cat on the streets, but it is harder still for a pregnant cat and her soon-to-be-born kittens. Without intervention, the cycle simply continues. Overpopulation is a problem that can definitely be addressed by spaying cats that are not part of a valid breeding program. Spaying your cat means never having to deal with her coming into season again. Roaming can be dangerous for a cat. Stray dogs are no feline's friend, and fights with other cats can be dangerous too. Cars can't always stop in time for a cat darting out into the road. Eating spoiled trash can cause internal upset, and pawing through that same trash can lead to injuries. There really is no bright side to the situation, but if you can put a stop to the behaviors that lead to the problems, spaying makes more sense than ever. There are two schools of thought when it comes to deciding the best age to have a cat spayed. It has long been the accepted practice to wait until a kitten was at least six months old to have her spayed. Breeders and vets alike believed it was important to let the kitten develop more before going through the procedure. Today, many veterinarians now believe there are no adverse affects associated with early spaying. According to Cornell University College of Veterinary Medicine, studies have shown that kittens can safely be spayed at three to six months of age. Whatever age you decide to have your pet spayed, spaying does rule out all possibility of her getting pregnant, as well as the opportunity for her to contract a uterine infection from one of her breeding partners. Additionally, most vets prefer to spay a cat when she is not actively in heat. Although the procedure can be performed during this time, the increased blood flow though the uterus does present challenges to controlling the bleeding during surgery, so it's best to avoid it if at all possible. To paraphrase an old saying, there's more than one way to spay a cat. 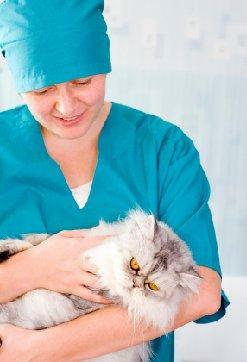 Tubal ligation is a method of eliminating a cat's fertility while leaving most of the reproductive system in tact. Under anaesthesia, the fallopian tubes may be cauterized or clamped in order to prevent sperm from entering the uterus. While tubal ligation does sterilize a cat, it does not put an end to the heat cycles and the behaviors that go with them, so it's not a perfect answer to the situation. Ovariohysterectomy is the medical term for completely spaying cats. In this procedure, a cat is anesthetized and the ovaries and uterus are completely removed through an incision in the abdomen. This eliminates a cat's ability to come into season and ends the hormone production that drives all of the unwanted breeding behaviors.The surgical site may be closed with dissolvable stitches, and if this is the case, the cat will likely not need a follow up visit unless the site becomes swollen or inflamed, a sign of infection. The vet may also choose to use standard stitches. If this is the case, the cat must be brought back to have them removed within ten days. Most cats are back to normal within a day of the procedure, however they may experience some lingering tenderness at the incision site, and should be handled carefully. Spaying is a routine procedure that causes less wear and tear on your pet than a lifetime of heat cycles and litters. When you stop to think about the massive problem of pet overpopulation in America, spaying our house pets is really just a matter of common sense, and one we should all consider.